In the event of national emergencies in Mexico and Central America, the Bush Pilots have been asked to assist providing and delivering relief supplies, transport injured persons, as well as make aerial searches for persons missing or in need. The Bush Pilots have provided such assistance three times in the past six years. To fund these activities, the Bush Pilots have received donations from members and other concerned persons and organizations however, the costs have always exceeded the donations. With the cost of flying and the fact that less persons are doing so, the Bush Pilots are concerned that when called for help in the future, they will not have persons or funds available to provide this important need. Your tax free donations will help to insure that these activities will continue to happen. Please remember that the Foundation has no overhead costs and all money contributed goes directly to our stated efforts. 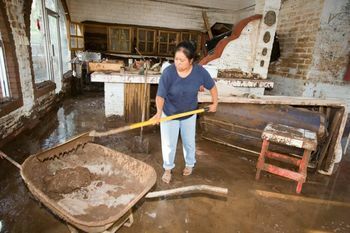 In the coastal city of Mulege, flash flooding from the results of Hurricane John caused widespread damage throughout the town and adjoining region. More than 250 homes were destroyed in the town, outlying villages, and remote ranches leaving many people homeless and in need. Severe flooding washed out portions of Highway 1 thusly cutting off access to the entire region via ground. The Mexican Red Cross requested help from the Bush Pilots and within two days, the Bush Pilots arrived in Baja to determine needs and within two more days, supplies were being flown in by Bush Pilot members. Over a two week period, over 100 aircraft transported clothing, food, water, medications, cooking supplies, and other important survival items. These supplies were sorted at the Hotel Serenidad and distributed by the towns people. In addition, Bush Pilot members that could not go down to Mexico contributed over US$3,000 of which some moneys were used to purchase items needed but not donated. Pilots paid their own aircraft expenses, some making two or more trips bringing these relief items to Mexico. 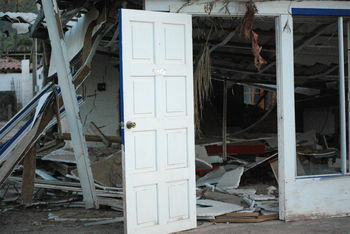 The historic village of Alamos was engulfed by the remains of Hurricane Norbert in 2008. 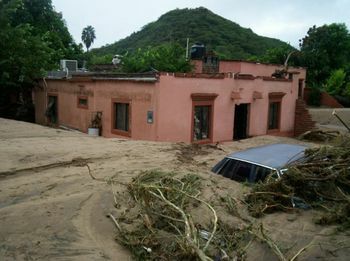 The tropical rains poured down on Sierra de Alamos for three days and the water accumulated by this rain had nowhere to go but flow through Alamos bringing with it torrential mudslides, trees, automobiles, and more. Many of the residents in the lower part of Alamos along the river lost entire homes and possessions, bridges were washed out, and commerce came to a standstill. Realizing that they were in need of help, townspeople requested help from the Bush Pilots. The Bush pilots, with assistance from the owners of the Hacienda de Los Santos, started an airlift within the next several days and had over 40 aircraft bringing in needed relief supplies. These supplies were sorted and delivered to those in need by both the Bush Pilots and the townspeople. The Bush Pilots received donations from its members of more than US$5,000 of which needed supplies that were not donated were purchased and delivered. Aircraft costs were donated by Bush Pilot Members. The remains of Hurricane Jimena created a severe tropical storm that covered Baja from La Paz to Santa Rosalea. Mulege was hit extremely hard as water building up in the mountains west of Mulege cascaded down the river that is the heart of Mulege. The worst flood ever, water climbed the canyon walls on either side of the river flooding the hospital, most of the commercial buildings downtown, crumbled foundations, as well as flooded the rooms and washed out the airstrip at the Hotel Serenidad. In addition, the town of Santa Rosalea was flooded as well as the outlying villages and ranches. All power and water supplies were down and all hotels were flooded and/or damaged in the area making them unusable. 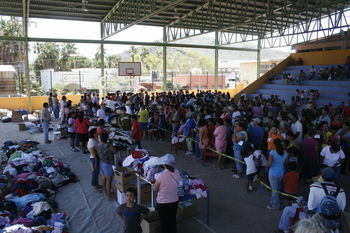 The Mexican Red Cross contacted us and requested help to distribute Red Cross survival supplies to the people in need. The Bush Pilots efforts started in La Paz where they had five member helicopters start delivering Red Cross relief boxes. They continued up Baja working from Cuidad Constitucion and Punta Chivato. As indicated, the runway at the Hotel Serenidad was washed out and that strip was critical for the delivery of supplies. With no other choice, the Bush Pilots hired a local contractor and paid US$5,000 to have the contractor rebuild the landing strip which consisted of hauling in dirt, the grading of, and compacting the runway. In the four weeks following the repair of the runway, more than one hundred fifty flights arrived either Mulege or Loreto delivering supplies. The Bush Pilots, with borrowed equipment including a pickup from a mining company and an ambulance from the Red Cross, transported all the supplies from the airstrip to the gymnasium downtown where they sorted as well as controlled the distribution of all the relief supplies. The pilots who brought down supplies paid most of their own expenses with the Bush Pilot’s out of pocket expenses over the four week period in excess of US$10,000.